I tried to replace all the bulbs in the headlight of my W204 (face lifted) this afternoon with whiter bulbs. I was successful in swapping the H7s with Diamond Vision 5K by following the instructions in the car's manual. However, I had problems removing the parking light bulbs (W5W). According to the manual, it said to pull out the bulb holder (no turning is required). However, it wouldn't budge at all when I tried to pull it out and I gave up eventually after 10 minutes of effortful tugging. Any bros or sis here have experience in replacing the parking light yourself? Your advise will be much appreciated. i pulled quite hard then came out... but dont now how put back in haha! then go work shop ask them make haha! Now my turning lamp is diamond vision 5k! Dont pull the wire else is time to visit a good workshop. I followed these instructions. I'm having problems with the 4th step. I pulled the wires but was afraid that it will snap. I grabbed the bulb holder and pulled but no luck as well. My finger tips are very sore now as a result . Maybe will try again this weekend when my fingers are better. Don't pull wire then pull where? Ok then try to pull the wire instead. Bro trust me, come out easy, gg in different story! 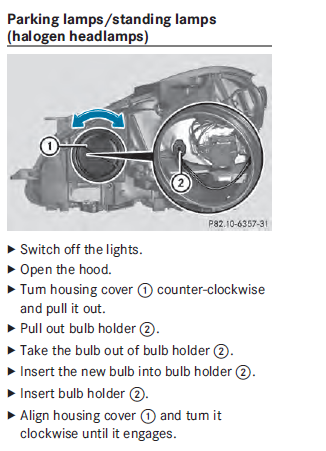 Will replacing the bulbs with normal aftermarket bulbs result in error message? Will try that. So did you have problems putting it back in like bro Jaxon mentioned? The price to pay for looking good. Sigh. As I was pulling, I saw the the reflector flexing in and out. Looks kind of flimsy and was afraid it will break, very scary. Then the question comes, I might need to do this on a yearly basis when LTA eventually comes calling for inspection to be done. There's a video on youtube that teaches you how to replace the bulbs on the "eyelid" of the pre-facelift W204, where the guy actually pulls the wire to pop the W5W bulb holder out. It looked rather easy in the video. But I'm afraid my wires will snap. Yap video always makes thing look so easy. Like the interior lighting job one of the bro damage the front panel cover. So becareful ya and gd luck. is there a Mercedes bulbs? Yes i pass to u previously is Mercs bulb.Wont void warranty and error codes after installation. Tried removing the W5W bulbs again this morning. Still not successful. The bigger question now is on the left side where the washer liquid bottle is blocking access to the bulb. Even with a pair of long nose pliers will also prove to be challenging. Finally gave up. Will have to live with a two-tone headlamp, sigh.